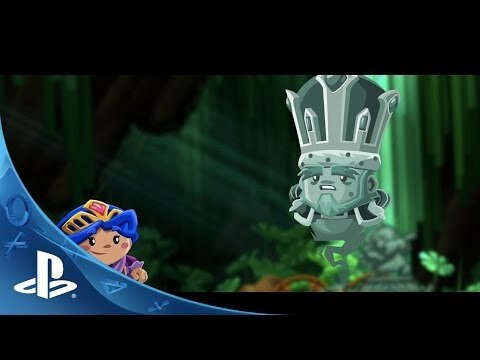 Embark on a journey to give his majesty the ride of his afterlife! Chariot is a humoristic physics-based couch co-op platformer in which a brave princess and her fiancé carry a funeral wagon through ancient caves, fending off swarms of looters while amassing riches, to bury the King's remains in a worthy gold-filled tomb. The Chariot’s large wheels and long tethers allow the heroes to reach higher ground, swing across chasms and perform all sorts of impressive maneuvers. Extract riches from the very walls of the caves in multiple environments and make your way to the exit by avoiding – or beating back – greedy looters as they attempt to steal your hard-earned loot! With skill-testing coordination mechanics and thrilling physics-based stunts required, Chariot will definitely please couch coop enthusiasts as teamwork and cooperation unlocks new possibilities. Chariot is a couch co-op platformer that can be played alone or with a friend. Players take the role of the brave Princess or her faithful Fiancé as they maneuver the departed king’s coffin-on-wheels through 25 levels set in 5 vibrant underground environments, with his majesty’s ghost giving them a piece of his mind every step of the way. Filled to the brim with emergent physics-based gameplay, Chariot offers hours of exciting exploration, fast-paced ride sequences and mountains upon mountains of loot!